The boom heard ’round the world. Imagine that a town the size of Chapel Hill grew to be larger than New York City in only thirty years. Impossible? Not in China. The small fishing town of Shenzhen, situated across the border from Hong Kong, shot up from a population of 68,166 in 1978 to 8.27 million in 2006. Shenzhen became a leading manufacturing center in the 1980s after the Chinese government designated the area a special economic zone — in essence a testing ground for capitalism. Americans best know China from the “Made in China” labels affixed to nearly every type of product available in our stores, from toys to clothing to furniture. We know that many well-paying manufacturing jobs have moved to China — including most of North Carolina’s textile and furniture industries — to take advantage of lower labor costs. But behind the “Made in China” label is an unprecedented transformation of China’s cities and the consumer craze among the rapidly growing Chinese middle class. As newly prosperous Chinese consumers demand the same amenities Americans have long enjoyed — meat for dinner, cars, appliances, modern homes — pressure on the world’s finite resources of energy, raw materials, and food has increased dramatically. 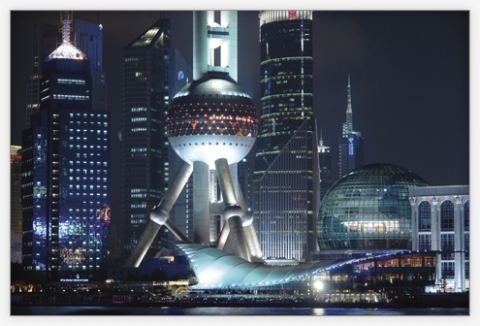 Thomas Campanella documents the urban transformation in China since the early 1990s in his new book, The Concrete Dragon: China’s Urban Revolution and What it Means for the World. “In terms of speed and scale and sheer audacity, China’s urban revolution is off the charts of Western or even global experience,” Campanella writes. Today China has 102 cities with more than a million residents, compared to just 9 cities and only 50 metropolitan areas of that size in the United States. Many rural Chinese are moving into cities to find jobs; since the 1980s, an estimated 225 million people have migrated from the countryside into cities. Another 350 million — more than the population of the United States — will likely make the move by 2025. In its race to modernity, China has been razing and rebuilding large parts of its cities, displacing millions of people. Beijing, with its growing perimeter of gated villa communities, housing estates, office parks, and shopping malls, is one of the most rapidly sprawling cities in the world. Sprawl is such a common feature of the urban landscape that the Chinese call it tan da bing, or “making a big pancake,” Campanella says. China is also building highways at record pace; the country had less than 200 miles of high-speed modern highways in the 1980s and 25,480 miles in 2006. By 2020, if China meets its projections for 53,000 miles of new highways, it will top the U.S. interstate system to become the largest highway system in the world. The Chinese are so proud of their new roads that there are tea-table style picture books featuring attractive aerial photos of the highways and interchanges. For those of us shocked at the massive scale and pace of building, Campanella reminds us of the nearest parallel: the building boom in major U.S. cities such as Chicago, home of the first skyscrapers, at the end of the nineteenth century. “We were China once,” Campanella says. “We were a nation that did things in a big way.” Europeans touring the United States in the 1890s described the building boom in Chicago and Manhattan with the same mix of fear and admiration that strikes Western commentators who today describe Beijing or Shenzhen, Campanella says. Chinese cities are so willing to experiment that China has become the Holy Grail for architects and urban planners, he says. Campanella explains that the feverish pace of modernization in China results from unleashed entrepreneurial zeal and yearning for a better quality of life. In 1949 the communist government led by Mao Zedong gained power after a twenty-three-year civil war against the ruling Nationalists. The new regime brought peace and order to the society, but also an increasing degree of control over economic and daily life. A passbook system known as hukou even dictated where people could live and work. During the Cultural Revolution, which lasted until Mao’s death in 1976, millions of students and intellectuals were sent to the countryside in an effort to erase class distinctions and eliminate the liberal bourgeoisie. The material desires of middle-class Chinese citizens, as Campanella describes them, are not unlike those of Americans. They want safe housing in the suburbs with modern amenities and plenty of space. They shop at IKEA and Wal-Mart, which at last count had 104 stores in China. They patronize drive-through McDonald’s and Kentucky Fried Chicken restaurants. Cars have become a status symbol. There are even Chinese McMansions. Most suburban housing developments in China, though, are clusters of mid-rise and high-rise apartments on gated estates. These estates usually offer parking, landscaped parks, and services such as restaurants, clinics, convenience stores, and gyms. Photo by Thomas Campanella; ©2008 Endeavors. 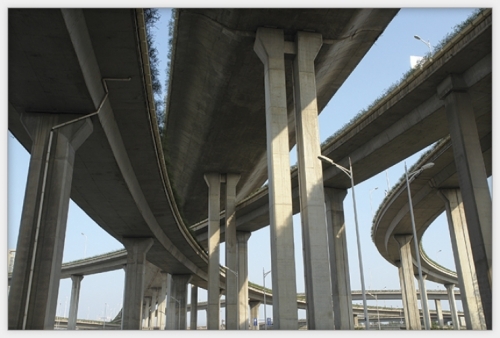 Merging elevated highways, Nanjing, 2006. By 2025 China will have the most extensive national highway system on Earth. Click to read photo caption. Photo by Thomas Campanella; ©2008 Endeavors. China’s rapid development, while improving standards of living for hundreds of millions, also has immense costs. One consequence — mentioned by almost anyone who has spent time in China — is air pollution. “You can’t go to China anymore and not be aware of how bad the air is,” says Gail Henderson, a UNC medical sociologist who has been doing research in China since the late 1970s. Campanella, who spends part of each year at Nanjing University, said the air there is so polluted from chemical plants that when he returns to his apartment after a few days away, a thick coat of black soot covers every surface. He often develops a hacking cough during his time in Nanjing. Air pollution, combined with the popularity of smoking among Chinese men, creates a “looming burden of disease,” Henderson says. An estimated 80 percent of Chinese men smoke; smoking is a ritual part of doing business in China. Chinese people are also starting to develop the same kinds of weight-related health problems that burden the United States. “There’s been huge changes in the way people eat and move in China,” says Barry Popkin, who leads a university team that has done surveys on nutrition and health in 230 locations in China since 1989. When his team began doing surveys, there were almost no people who were overweight or obese. Now nearly one-third of adults are overweight or obese, Popkin says. Rates of diabetes and hypertension are increasing rapidly, as is mortality from cancer and heart disease. The Chinese now consume three times the amount of cooking oil and meat that they did ten to fifteen years ago, Popkin says. People are also more sedentary. Although millions still ride bicycles in China’s cities, the number has been plummeting in recent years. Those who can afford to drive prefer cars, and roads have become increasingly congested and dangerous for cyclists, Campanella explains. Other consequences of China’s development include the exploitation of rural migrants who come to cities in search of work and end up in low-paying and often dangerous jobs in construction and industry. And China has destroyed much of its architectural heritage in constructing its modern cities, Campanella says. Virtually all of the historic hutong, or narrow-lane neighborhoods in Beijing, have been razed in recent years, often despite being listed as preservation zones. China’s urban revolution also has broader consequences for the rest of the planet. One irony about China’s development, Campanella says, is that it comes at a time that Western nations have finally become aware of the dangers of climate change. As humans burn more fossil fuels to power electricity, manufacturing, and transportation, climate scientists have been documenting rapid and unprecedented rises in the atmosphere’s carbon content. Meanwhile, a new coal-fired power plant opens every ten days in China, according to Campanella. In 2007 China overtook the United States as the leading producer of greenhouse gases, according to the Netherlands Environmental Assessment Agency. In 2001 China’s total greenhouse gas emissions were 42 percent of the level of the United States. China’s appetite for oil also places pressure on the world’s supply. China “is now the second largest consumer of oil in the world and burns through more fossil fuel than Russia and India combined,” Campanella writes. “If we continue our addiction to oil and China continues to demand oil, something’s got to give,” he says. China also buys large portions of the world’s coal, cement, copper, iron, and timber. 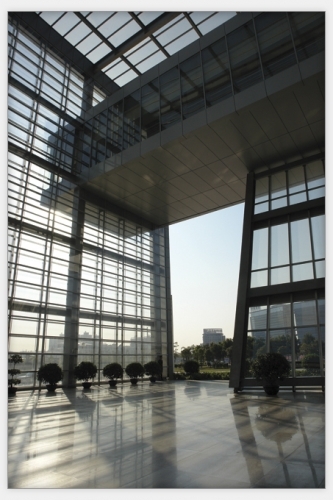 Dongguan Library: One of the world’s fastest-growing cities, Dongguan aims for high culture. Its sparkling new central library covers 125,000 square feet. There is a small but growing movement toward sustainable development in China, says UNC’s Robin Visser, who studies Chinese art and culture. Visser says many recent Chinese films, novels, and art criticize the profiteering, corruption, waste, and short-sighted thinking that characterize much new development. “As people go through the transformation, they recognize there’s something missing,” Visser says. In the last five years a new generation of architects and urban planners has become much more interested in sustainable building design, she says. Some are trying to recapture some of the lost values associated with traditional Chinese philosophies, which promote sustainability and simplicity. For example, Confucianism promotes moderation in all things, including consumption. Confucianism also has a notion of harmony between people and nature. Taoism is also “all about nature,” Visser says. It tries to help humans understand their dependence on nature, emphasizing minimalism. Likewise, Buddhism emphasizes harmony and respect for all living beings. Visser senses a turning tide in thinking about sustainability among journalists, artists, and educators, but she says the average Chinese person is less knowledgeable about sustainability than is the average American. And the vast majority of Chinese development remains unsustainable, Campanella says. Still, there are some encouraging signs. In 2005 the Chinese government passed a law promoting the use of renewable energy. Solar water heaters glint from many rooftops (China has 60 percent of the world’s installed solar water heaters.) On June 1, 2008, Beijing began a ban on plastic bags. Because China has shown itself willing to invest in ambitious urban development projects, Campanella says that China may show the rest of the world how to build a sustainable city. In coming decades China plans to build a self-sufficient, sustainable city on an island in the middle of the Yangtze River near Shanghai. The city, called Dongtang, will get its power from wind farms and biofuels. Organic farms will provide food. People will travel by solar-powered water taxi and buses powered by hydrogen fuel cells. Eco-tourism and high-tech industry will provide jobs. Sheila Read was a student who formerly contributed to Endeavors. Thomas Campanella is an associate professor of urban planning at Carolina and a visiting professor at Harvard University. Gail Henderson is a professor of social medicine in Carolina’s School of Medicine. Barry Popkin is a professor of nutrition and director of the Nutrition Transition Research Program. Robin Visser is an assistant professor in the Department of Asian Studies. Filed in city & regional planning.